Sarina is a reader and commenter on my Kitchen Operas Facebook Page. When I asked if anyone had vegan recipes they’d like to see for VeganMoFo, Sarina responded enthusiastically with vegan spanakopita! 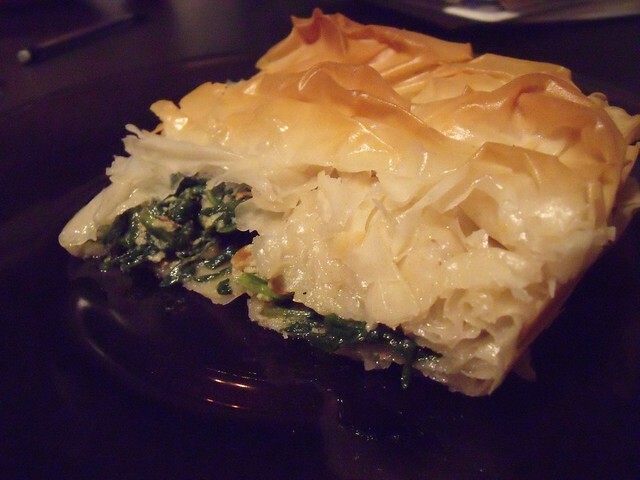 Of course this got my foodie brain going, so off I went researching, checking out recipes, and I came up with this vegan version of the delicious spanakopita. And it was sooooo good you could serve it to vegans and omnivores alike and they’d all love it. I’m thinking about serving this at a dinner party along with a lemony salad to cut through the rich pastry. The secret is a homemade vegan cheese. Yes, I know that sounds intense, but it’s way easier than you think… you just blitz almonds and seasonings, strain it overnight, and bake. The whole recipe is below, and it’s yummy. And it actually surprised me how much it tasted like dairy feta. Somehow the garlic and the lemon and the salt make a very feta-y taste! And once you have your cheese (which I made the day before), your pie will come together quite quickly. And you get to play with phyllo. 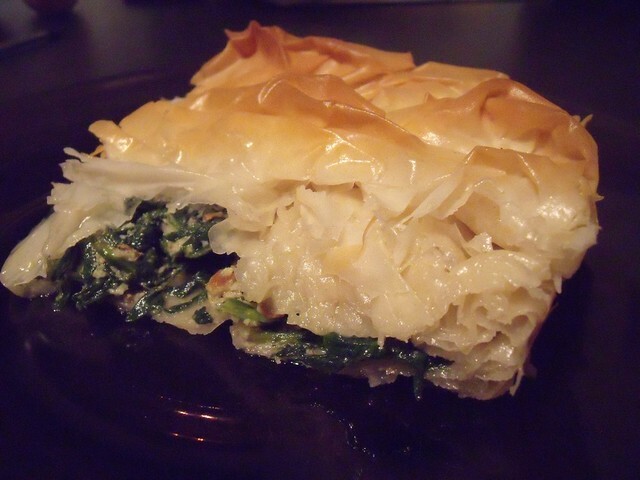 I chose to use coconut oil here, and it’s a tasty match with the phyllo pastry and the spinach. I recommend going more lightly with it than you might with other fats, as it tastes so rich. Thanks, Sarina, for the inspiration! This was a really tasty dinner that I’ll be replicating again soon! And it’s got me thinking about all sorts of phyllo pies, and phyllo desserts with coconut oil, and the delicious possibilities are endless! Place your spinach in a colander (you may need to do this in a couple of batches) and wash it well. While the leaves are still wet, sprinkle with the salt. Rub the salt into the leaves of the spinach, while tearing the leaves into small pieces. The spinach will work down to a tiny amount compared to what you started with. Rinse the spinach to remove the salt, and squeeze to remove the excess liquid. Transfer the spinach to a mixing bowl, and add the feta, garlic, black pepper, cayenne, and olive oil. Mix well to combine. 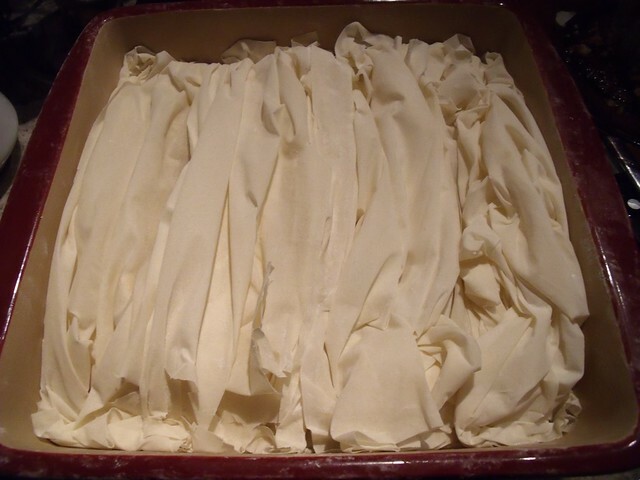 Spread out your phyllo on your work surface. 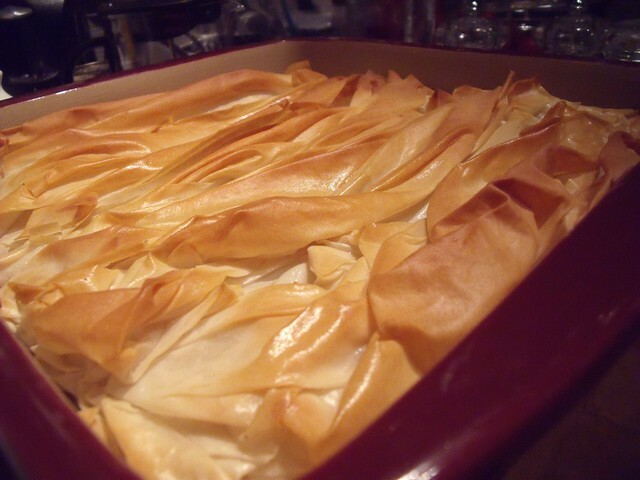 Grease your 23x23cm (9×9″) baking dish with coconut oil, and begin to layer sheets of phyllo in the baking dish. 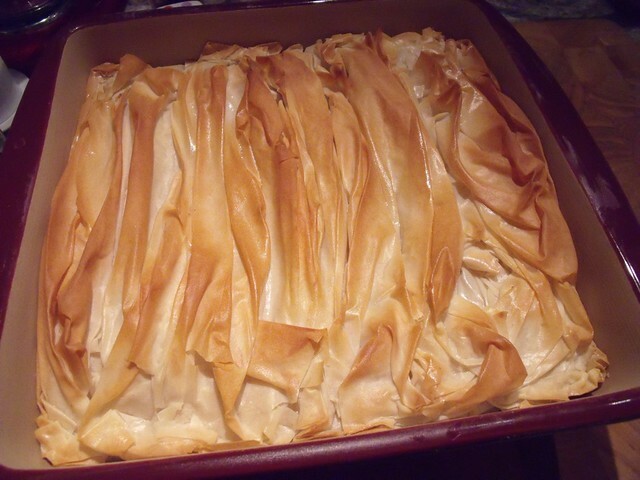 Between each layer of phyllo, brush it with a light coating of coconut oil. 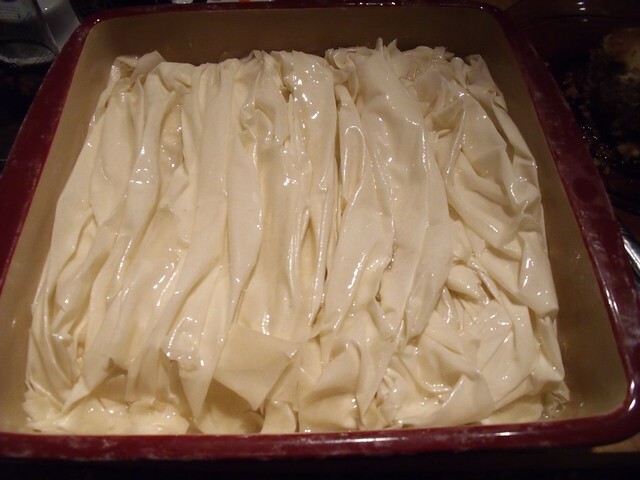 Your phyllo sheets will overhang the baking dish. 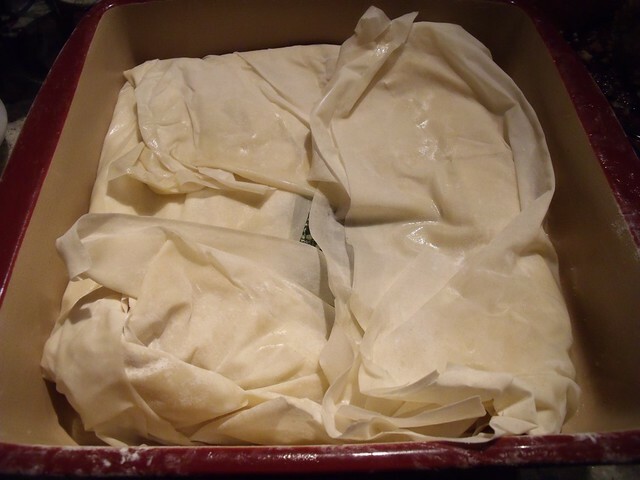 Keep layering phyllo until you have four sheets left, and cover your remaining sheets of phyllo with a clean and damp tea towel. 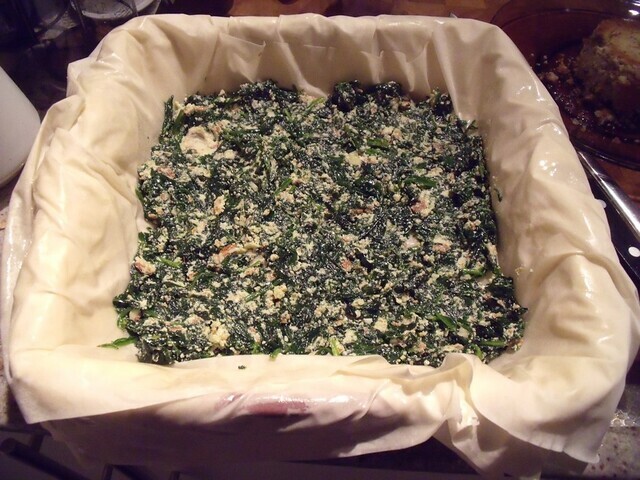 Place the spinach filling in the centre of the baking dish, and spread it out evenly across the phyllo. 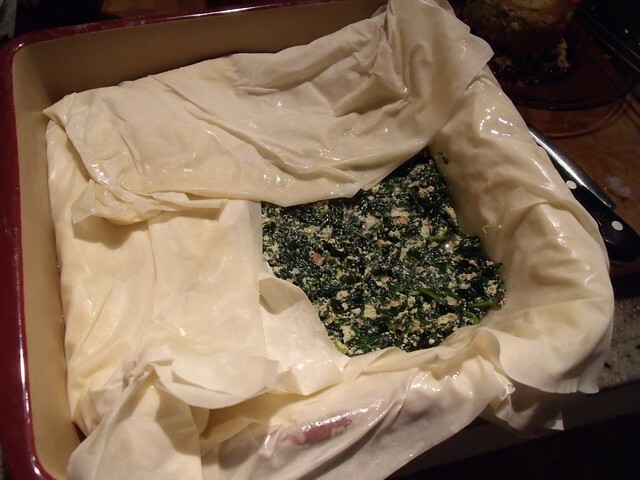 Fold the overhanging phyllo over top of the spinach filling, and brush with coconut oil. 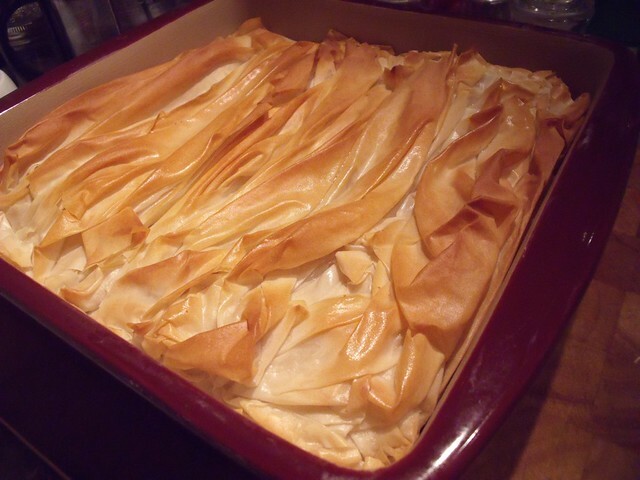 Scrunch your remaining phyllo sheets up and place on top of the dish. Brush lightly with coconut oil. Bake at 400F for 20 minutes, let cool for 5 minutes, cut into 6 slices, and serve warm! Place almonds in a bowl, and cover with cool water. Soak for 12 hours or overnight, then rinse and drain. In a food processor, blitz almonds, lemon juice, oil, garlic, salt and water. Keep going until the mixture is very creamy, 3-6 minutes. Line a bowl with a triple layer of cheesecloth or a ‘nut sac‘ and let strain in the fridge for 12 hours or overnight. Once your feta mixture is strained, preheat your oven to 350F. Grease a ramekin with olive oil, and press your feta mixture into the ramekin. Bake at 350F for 40 minutes. Remove from oven and let cool. Once cool, store in the fridge or use in vegan spanakopita pie! We had to use a vegan feta without nuts and olive oil instead of coconut oil due to a family member’s nut allergy but I am in love with this recipe! It turned out fantastic even with our substitutions and will become a regular feature in our home! That looks FAB! I’m looking forward to making the feta recipe too. This looks amazing… I’m definitly bookmarking it. One thing I really miss since giving up dairy is feta cheese… So I’m excited I came across this recipe! As a Greek vegan, I feel I must congratulate you! It looks really authentic and I’m sure it tastes great! I made it last weekend and it was wonderful! Lots of work to make the cheese but it was worth it to get that terrific flavour. Thanks again. Have made this recipe a lot, and it’s fantastic every time!! I love it too — so glad it’s working out for you!! !